Have you painted your Pumpkin yet? As well as carving our traditional pumpkin – a smiley face as J doesn’t like the scary ones! – we will also be painting one teal. This is to take part in the brilliant Teal Pumpkin Project which encourages people to offer non-food treats at Halloween, alongside the normal chocolate and sweets. This gives people with food allergies, or any other dietary restriction, a chance to join in all the fun with their friends. This year we bought and painted a plastic pumpkin so we can reuse it year after year. 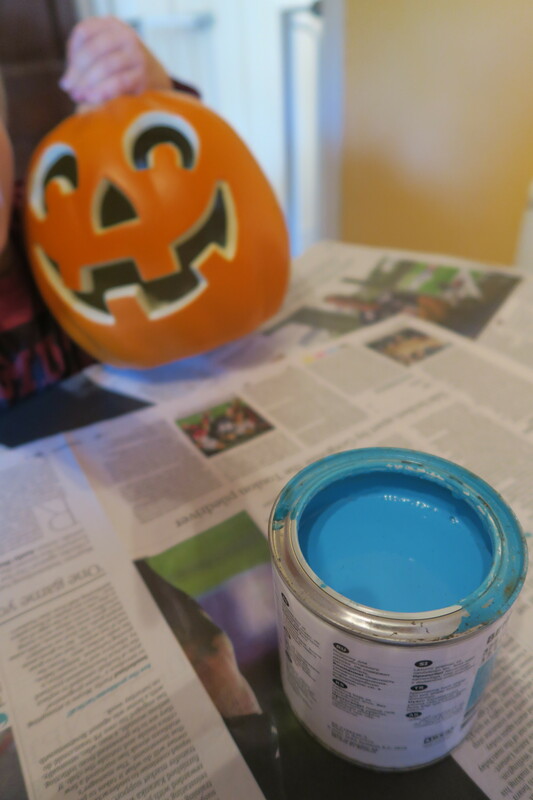 You can easily just paint a normal one, make one out of card or print off a teal pumpkin picture. Teal is the colour of food allergy awareness. It is a tricky colour to pin down and I think ours looks a bit more like plain blue – but you get the idea! 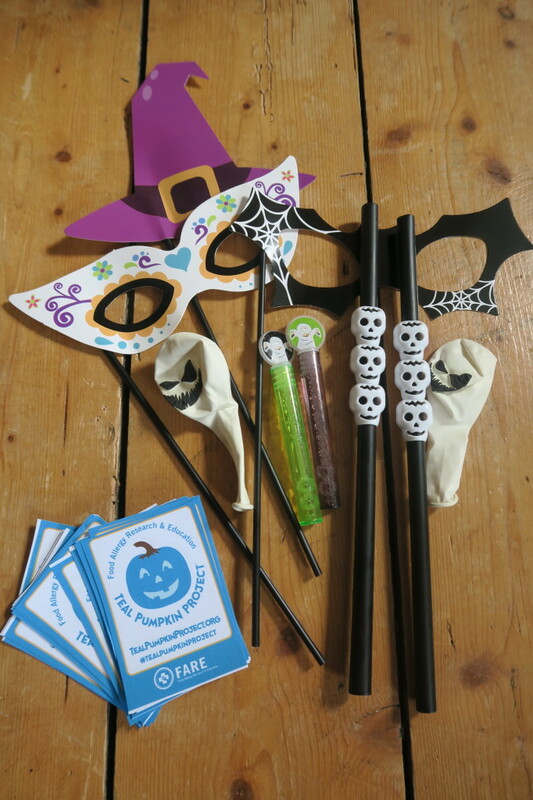 We took a trip to the pound shop and picked up some great Halloween themed treats – cardboard masks, balloons, bubbles and skeleton straws. It only cost £5 for 40 items, plus the purple bag to put them in, so it doesn’t have to be expensive. 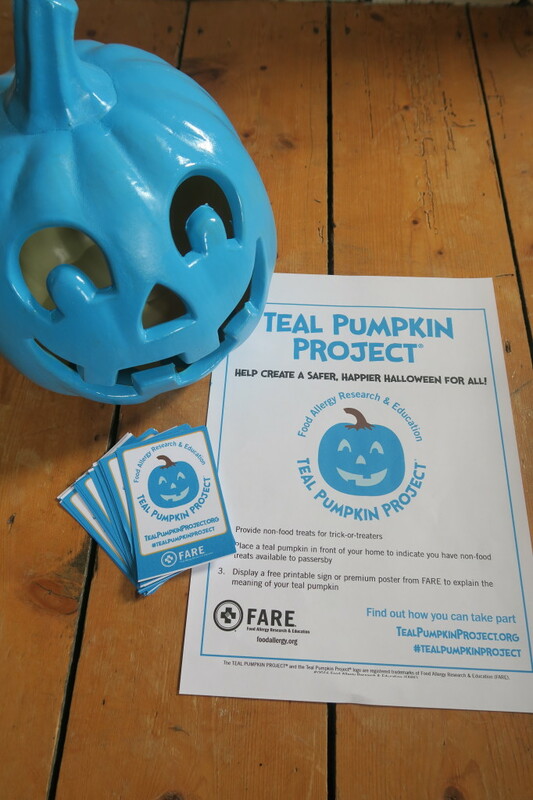 We first heard about the Teal Pumpkin project in 2014 and the word is slowly spreading but most people who don’t deal with allergies daily still haven’t heard of it. So tell your family, friends and your children’s classmates. Post on social media and encourage others to get involved. This year we have taken J’s pumpkin and bag of treats to his nursery, along with a poster and some flyers I printed from the FARE wesbite. It’s a fun way to spread the word and make learning about food allergies a positive experience. On Halloween, put your teal pumpkin out and offer people your non-food treats alongside the normal haul. Lots of children love getting bubbles or balloons and many parents will be thankful to have a bit less sugar in their tummies! It is a great opportunity to explain what it is all about and raise awareness of food allergies. If you are going to go trick or treating, stay safe. Most people will just be offering the normal sweets and chocolate so talk to your child about how to manage it. 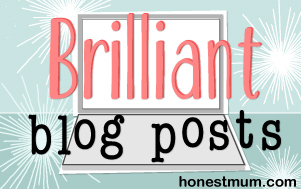 I like this post from Kortney at Allergy Girl Eats about how her parents used to make a game out of sorting Halloween candy. Take some safe treats or use something like the ‘Switch Witch’ to swap out treats. This is such a good idea, we don’t usually do anything for Halloween but its a good idea for raising awareness when it comes to allergies. I still have to buy our pumpkins – leaving it late. I so want to join the teal pumpkin project. How cool does your teal pumpkin look! I love the concept behind it.